An ongoing study by Karelia UAS, Natural Resources Institute Finland (LUKE) and Finnish Forest Centre analyses local socio-economic impacts of heat entrepreneurship based on local wood fuels. The study focuses on the case of Eno Energy Cooperative – a local heat enterprise producing annually about 15 500 MWh heat with local woodchips for both public and private customers. 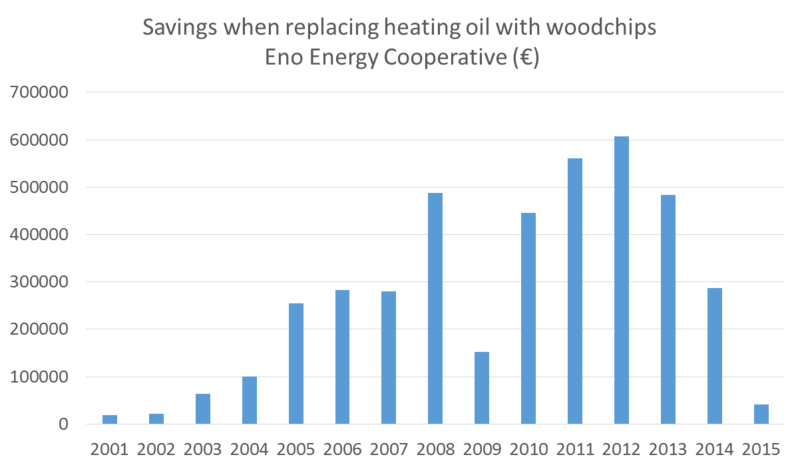 In Eno, replacing heating oil with renewable alternative has resulted 4.1 MEUR cost savings in 2001-2015. The savings, resulting mainly from significant price difference, are allocated to both public municipal customers (1.8 MEUR) and private household customers (2.3 MEUR). As this income is further invested, it generates additional socio-economic benefits. Assuming that public sector used the savings for local social services and households for local retail/commerce, additional induced socio-economic income impact was about 2.85 MEUR and employment impact about 75 jobs. These impacts, resulting of cost savings, are very significant for the local economy. As the study continues, also the forest owners’ benefits, impacts of the plant construction, and the economic supports will be considered in detail. Eno Energy Cooperative attends GREBE EES Scheme in Finland (autumn 2017). The Co-op also shares actively identified practices through the networks of heat entrepreneurs both regionally and nationally, and is also know reference site for international visitors.